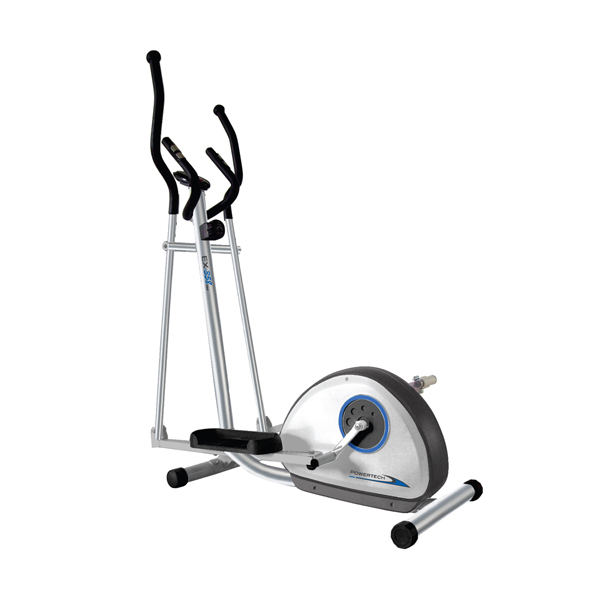 A great entry level home trainer, the Powertech EX358 Elliptical trainer is ideal for performing cardio based exercise. Featuring 8 levels of manual tension control, which can be easily adjusted using the control knob on the upright post. Switch between two different sets of handlebars to work on either your upper or lower body, integrated hand pulse sensors monitor your heart rate as you exercise – this provides a more accurate calorie burn count. The large pedals are ergonomically designed and ribbed for added grip and safety. Check the computer regularly via the LCD screen as it will provide feedback on time, speed, distance, calories, pulse and burn count. On the elliptical trainer you can also perform forward and reverse actions.